Best-loved children’s author and illustrator Shirley Hughes has won the Kate Greenaway Medal twice as well as the prestigious Eleanor Farjeon Award for her services to children’s literature. 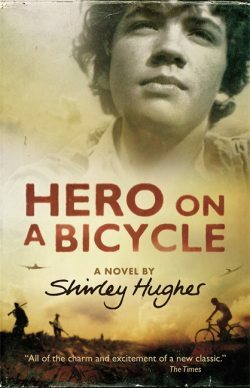 Hero on a Bicycle is Shirley’s first novel. Italy, 1944: Florence is occupied by Nazi German forces. The Italian resistance movement has not given up hope of liberation, though ‒ and neither have thirteen-year-old Paolo and his elder sister, Constanza. Both are desperate to fight the occupation, but what can two siblings do against a whole army with only a bicycle to help them? Hero on a Bicycle is available as a paperback wherever books are sold.